LG Quantum Review - Learn everything you need to know about the LG Quantum before you buy. 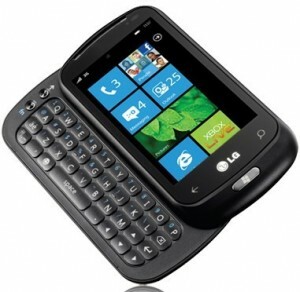 The LG Quantum is the only phone operating on Windows Phone 7 OS that has a QWERTY slider (A physical slide out keyboard). That makes it desirable for those that have to have a physical keyboard, but much more unattractive to those that like a thinner phone overall. The Windows Phone 7 OS has a lot of great features and the Quantum makes good use of them. The phone is by far one of the heaviest, if not the heaviest, smartphone on the market. But because of that, it feels really solid to hold in your hand. The screen is 3.5 inches small and doesn’t do very well in bright sunlight. If having a physical keyboard and an operating system that isn’t overwhelming is important to you, this is your phone. The 3.5 inch screen is smaller than most, the resolution is comparable at 480 x 800, but the screen doesn’t do well in direct sunlight. It is heavy at 6.2 ounces, has a good solid build and is rubbery making it nice to hold. It is also thicker than most phones because of the physical keyboard so if putting your phone in your pocket is important this might be a drawback (it will be even thicker with a case). The sliding mechanism is solid…almost too solid. It definitely helps you realize that the build was not cheaply made, but it’s not as easy to slide as other phones with a sliding keyboard. The keys on the slider are spacious and feel good when you are typing. The other buttons on the phone are sometimes difficult to feel because they are so flush with the rest of the build, but it helps keep the phone as sleek as possible. The camera takes good pictures and you can also take HD video at 720p. In Windows 7 Phone 0S, changing from the camera to your picture gallery is done by one simple swipe to the right. Another cool feature on the phone’s OS is the ability to push media to a wi-fi enabled device. So, if you have an internet enabled TV or speakers, you can push media from your phone, over the wireless network to these devices. The talk time on the Quantum is not nearly as good as most phones at only 300 minutes and with 340 hours of standby time. The standby time is actually really good, but the talk time is one of the lowest on the market. Nothing new on the phone as far as additional features goes. However, the Windows Phone 7 OS has some really cool options for the GPS function and X-Box live connectivity. It also has all the features you’d expect from a typical smartphone; wi-fi, Bluetooth and GPS. "We wish to express to you our sincere appreciation for your cash contribution. Supporting Children's Miracle Network hospitals with your contribution is the most effective way to save lives of children throughout North America. "